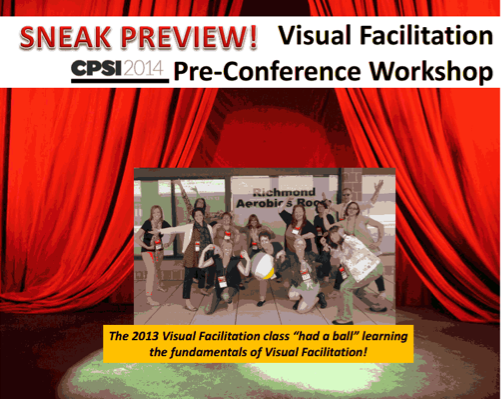 Sneak Preview for CPSI Workshop! Ingrid will be presenting at the Creative Problem Solving Institute (CPSI) conference on June 18th-22nd, 2014, which is coming up fast! This year will be CPSI's 60th anniversary, making it the longest continuing creativity conference in the world. World-class facilitators join together to create an active learning environment, teaching ways to maximize creative thinking and innovation skills to move to the next level. The entire experience is focused on helping move ideas into action, get a chance to meet with top business leaders, educators, practitioners and learners from all over the world to build your personal network! To learn more about the CPSI conference click HERE! Ingrid will be co-creating an integrative workshop on visual facilitation and the power of visual communication in organizations and strategic planning. Interested yet? Well, here is the sneak peek to what you'll be experiencing with her at the conference!